Growing up, there was a home in our neighborhood that had a massive radio antenna, much like the one in the photograph that is part of this blog post. As a kid, I was fascinated by the antenna. It was so big. Actually, I was captivated by the thought that I could talk to people around the world via a ham radio. As an adult, while I may still be enamored by the prospect of communicating with people around the world, these days I do that via email, twitter and the telephone. 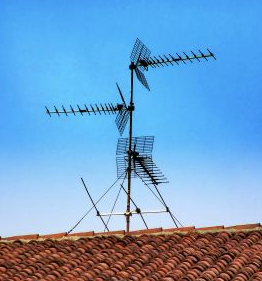 While I have no problem with others wanting to be ham radio operators, I would not want to see one of these radio antennas on the roof of a home at my community association. And I know that many of you feel the same way about not allowing radio antennas, like the one in the photograph, at the associations you live in, manage or work with. We previously posted a blog article regarding H.R. 4969, the Amateur Radio Parity Act introduced by U.S. Rep. Adam Kinzinger (R-IL), legislation that would make unenforceable community association prohibitions and CC&R restrictions on the installation and use of amateur radio towers and antennas. If H.R. 4969 becomes law, homeowners who want to install a radio tower or antenna for amateur radio use would NOT have to go through the architectural review process or follow existing community guidelines. They could just install these large antennas. The national Community Associations Institute (CAI) has been following this proposed legislation in Congress. CAI has initiated a campaign to preserve the rights of America’s community associations with regard to amateur radio towers and antennas. Most recently, CAI has issued a Call To Action, as apparently this proposed legislation is gaining support in Congress. We need to let our legislators know that we do not want them supporting the Amateur Radio Parity Act.